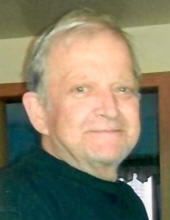 George L. Robinson, age 74, of Grovertown, Indiana, formerly of Hickory Hills, Illinois, passed away peacefully at his home Monday, March 25, 2019. George was born August 14, 1944 in Chicago, to John and Harriett Robinson, both deceased. On February 26, 1966, in Chicago, he married Karen Knor, she preceded him in death on January 24, 2005. He is survived by his children, Michael J. Robinson of Frankfort, IL and Christine Dunkel of Grovertown, IN, and two grandchildren, Alexandria Dunkel and Niko Robinson. He was also preceded in death by a sister, Maureen Rosenkranz. A visitation will take place Wednesday, March 27, 2019 from 4-8pm (CT) at Gaidas Funeral Home, 11028 Southwest Highway, Palos Hills, IL and Thursday, March 28, 2019 from 4-8pm (CT) at M.C. Smith Funeral Home, 153 E. Washington St., Knox, IN. A funeral service will take place Friday, March 29, 2019 at 11am (CT) at M.C. Smith Funeral Home in Knox. Burial will follow at the Fletcher Cemetery in Hamlet, Indiana. To send flowers or a remembrance gift to the family of George L. Robinson, please visit our Tribute Store. "Email Address" would like to share the life celebration of George L. Robinson. Click on the "link" to go to share a favorite memory or leave a condolence message for the family.